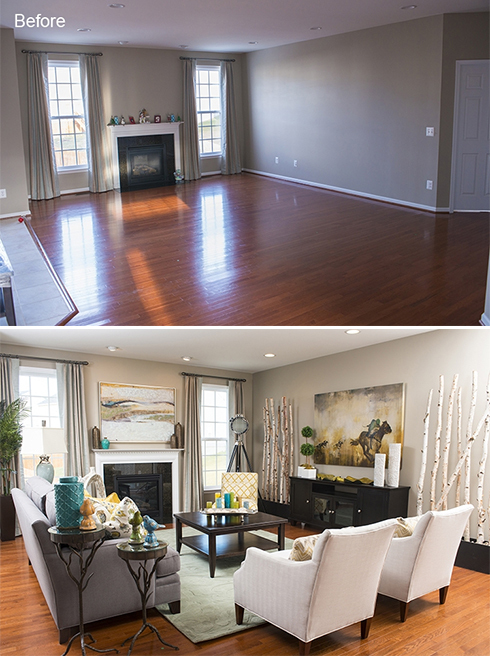 The winners preferred neutral hues and greys, but expressed that they were interested in adding some fun pops of color. Belfort Furniture Senior Designer Ash Morsi was able to do just that with a combination of furnishings, accessories, window treatments, and a rug. He began by anchoring the room with a lovely Vanguard sofa dressed in a warm grey hue. The fluted, tapered leg gives this sofa the contemporary style desired with a comfortable seat. Facing the sofa, the Weston Entertainment Console by Aspenhome provides the perfect storage and setup for a flat screen TV. 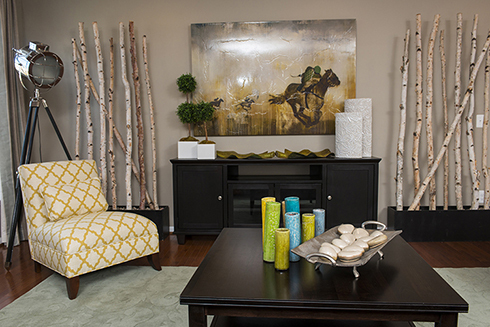 The console is flanked on both sides by large nature inspired accessories, bringing warmth into the room. Also incorporated in this room, two Azriel chairs from Sam Moore give balance and allow for a better eye flow and traffic. We love the fun chevron pillows that accompany these chairs. Adjacent to the fireplace, the armless Rhys Sam Moore chair covered in a trendy geometric print adds a balanced boldness and flair. The Surya Rug brings all of these elements together and brings a coziness just as the client's desired for this room. 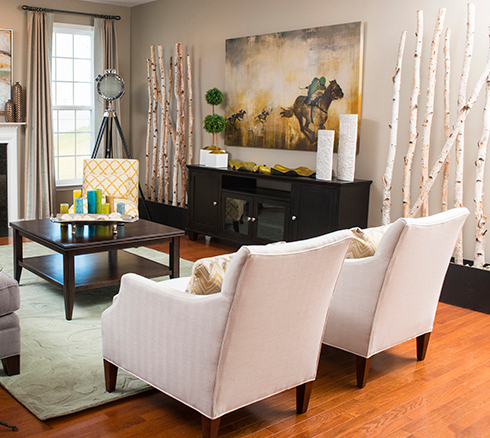 The accessories and window treatments are the finishing touch that truly make this room complete. 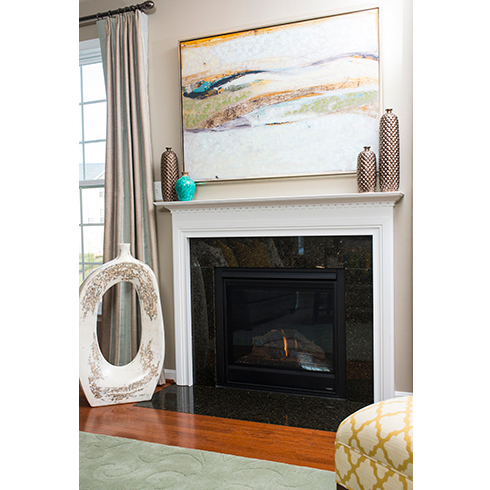 A piece of artwork hanging above the fireplace brings together multiple bold hues that are utilized throughout the space with various accessories. The pillows add depth and style to the sofa, featuring floral and plaid prints. By bringing in neutrals and accenting with bold color, an amazing space to love and enjoy for many, many years to come was created. 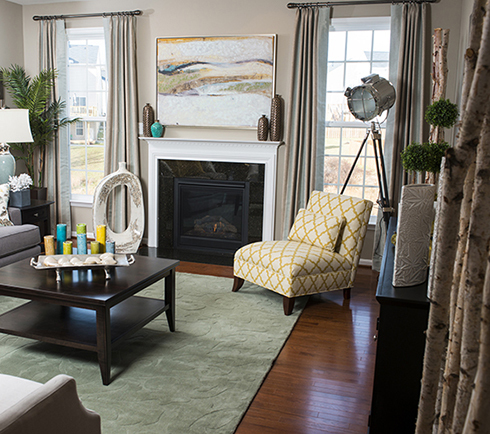 With hundreds of room settings on display and the area's largest furniture selection, visit Belfort Furniture's Furniture Campus - conveniently located in Dulles, Virginia - for inspiration and ideas for your own home. Need some additional help? 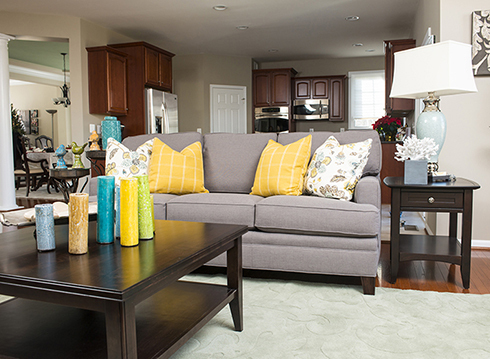 Take advantage of our Free Design Services offered at Belfort Furniture. Browse additional projects with Before and After pictures from our Belfort Furniture Design Team online!